Help Your Associates Help YOU! People who exercise and eat right feel better, healthier, and stronger are more productive and happier. 30 minutes of exercise during the day improves health over time and has hormonal effects that simply make people feel good and ready to go. Total Human Performance encourages a balanced program of wellness that follows the Five Aspects of Whole Health as defined by the National Institute of Whole Health. Group Exercise classes – Classes are indoors or outdoors – number of participants depends on size of facility – ALL FITNESS LEVELS! 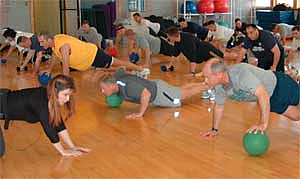 Fitness Room Orientations – Exercise machines and equipment can be intimidating. An orientation on the use of such equipment encourages your staff to use the facility! Contact me to set up a discussion on how I can help you improve the health and well-being of your company’s employees!